My cousin Ellie is an eight-year-old Seth Godin-In-The-Making. Ellie visited from Seattle a few weeks ago, with her mum and little sister Lottie. By Sunday night, we’d squeezed every pip out of the Pumpkin Festival, stacked a whole heap of firewood (a sweaty, splintery job that she and Lottie effortlessly reframed as a game of enchanted discovery – a story for another time) … and now everyone was milling about in the kitchen as dinner slowly came together. Things were getting a little tetchy — hungry, tired bodies, starting to aggravate each other. Ellie saw a need. She saw an audience that she could help. 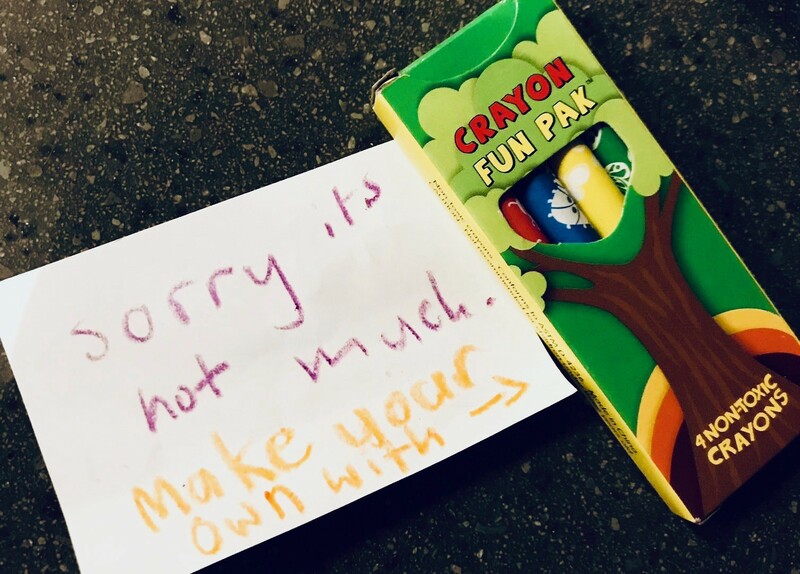 Quickly, she gathered some basic materials — a post-it pad, the pack of child-appeasing crayons from the plane — and vanished upstairs. Minutes later she announced that she’d made something for the kids — a Treasure Hunt. Now, my boys Nick and Stan are big and cynical now. But they were happy to be distracted — and Lottie was ecstatic. Who doesn’t love Treasure, right? So off they set. Ellie gave them the first post-it, and they headed out, following the waxy instructions. They found the next clue tucked under the wooden bear on the deck … the one after that slid in a book on someone’s closet shelf. I was getting dinner and was a bit gutted I couldn’t join in, but stirring away at the stove I watched them scramble all over the house. Ellie was racing round too, always with a backward eye on Lottie and the boys. And then I realized what she was doing. How she’d seemingly put together a pre-dinner entertainment for the whole family in less time that I take to clean my teeth. She was creating it as she went along. She’d begun with the bare minimum — a couple of hand-drawn notes, and a few good ideas for hiding places — and had just started the ball rolling. As the others found each clue, she was writing and hiding another one a couple of links ahead in the chain — that’s all she needed to do, to keep ahead of them, and keep them engaged. And in fact, Ellie was altering her path, changing her choices, depending on what her audience was experiencing. One clue on the deck had blown away a little — so she anchored the next one with a chair leg. Another note wasn’t quite readable — she wrote larger after that. 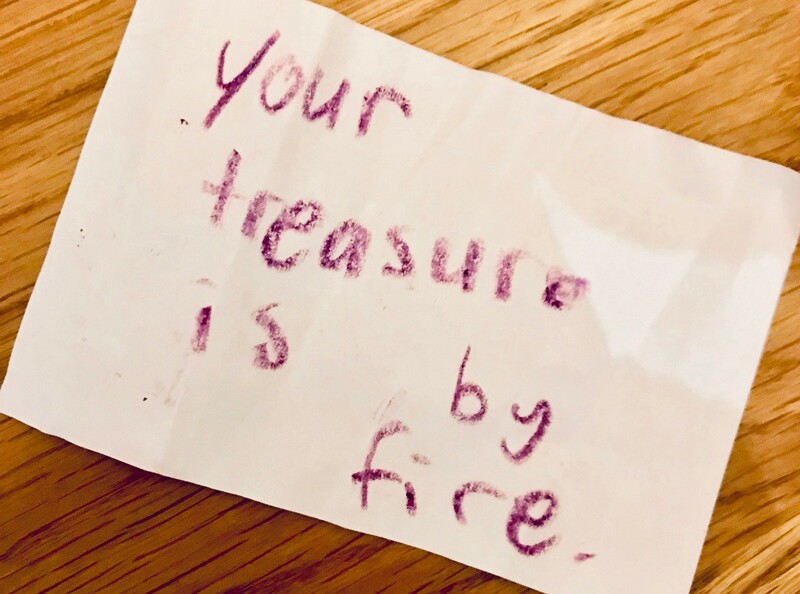 And the Treasure was quite brilliant — it was the airplane crayons. Seriously. Along with some encouragement to go create something amazing for themselves! Make your own treasure. Wise words mate. She created the perfect Minimum Viable Product for the minimum viable audience she wanted to serve — and in doing so, she not only helped keep a bunch of hangry kids from kicking off, she also inspired me to do what I’m going to do now. I’m going to create something as I go along. Starting today, I’m going to write, video, record or otherwise commit to the interwebs, 24 pieces of content — a kind of Advent Calendar of Crunchy Brain Candy. Daily thought-gems to open and enjoy (the sugar-free kind, to help keep you lithe and trim as we enter the Gorging Season — you’re welcome). I’ve been thinking about doing this for a while, and fully intended to plan it all out — because how could I possibly launch a promise this big without being thoroughly ready, with every detail precisely prepared? And inevitably I am SO far from ready it’s terrifying. Truthfully, I don’t think I’ve ever been ‘ready’ in my life. I’m going to start that ball rolling — and do my damnedest to keep one step ahead of it. It’s what Seth would do. And, crucially, Ellie too.